Bill to punish PA for payments to terrorists passes overwhelmingly. Only Meretz and Joint List oppose law. The Knesset passed the 'pay to slay' law i Monday night. Under the law, the Israeli government would withhold tax funds to the Palestinian Authority as long as the PA continues to pay salaries to terrorists who attacked Israeli citizens. 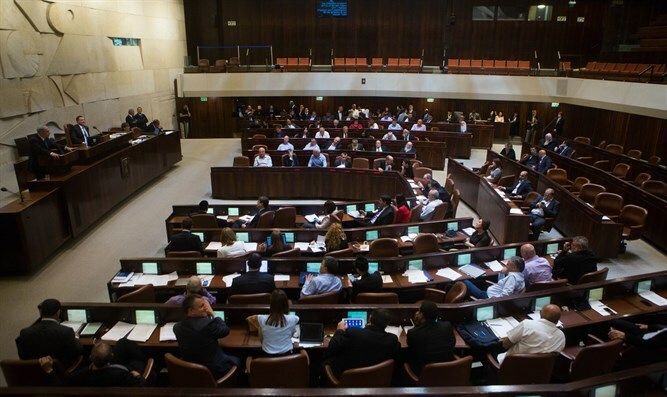 The bill, which was proposed by MKs Avi Dichter and Elazar Stern, was passed in its second and third readings by a vote of 87-15. All Knesset factions except for the far-left Meretz part and Joint Arab List supported the bill. Following the bill's passage, Israel will freeze more than NIS 1.2 billion ($328 million) in tax revenues which will not be transferred to the PA this year. MK Elazar Stern said after the passage of the law: "This historic law will significantly weaken the encouragement of terrorism by the Palestinian Authority. We must stop the economic incentive given by the Palestinian Authority to the terrorists, an incentive that encourages further terror. Thus every Palestinian youth will understand that it does not pay for him to choose the path of terror. There will be no more encouraging of terrorism at our expense." Knesset Foreign Affairs and Defense Committee Chairman Avi Dichter added that "the PA transfers monthly salaries to terrorists and their families at a rate of about NIS 1.2 billion a year, which is about 7% of the Palestinian Authority budget." "If you do not change the entrance ticket to this factory, you will go one day," he said, adding that "the PA has turned itself into a factory that employs murderers. It is very easy to be accepted into this factory. All you have to do is kill Israelis. When you are stopped or get killed, you automatically gethired to work in the factory. Mahmoud Abbas and his aides - if you do not change the entrance ticket to this factory, you will go to sleep one day and get up and cut." Defense Minister Avigdor Liberman said in response to the law's approval: "We promised to stop the celebration of the terrorists' salaries, and now it is finalized. Every shekel that Abu Mazen pays the terrorists and murderers will be automatically deducted from the Palestinian Authority budget." The Israeli law is reminiscent of the Taylor Force Act, a bill which was passed by the US Congress earlier this year. The law is named for US army veteran Taylor Force, who was murdered in a terrorist attack while vacationing in Tel Aviv in 2016, and cuts US funding to the PA as long as it continues to pay salaries to terrorists. Earlier Monday, the Australian government ended direct aid to the Palestinian Authority on Monday over fears it could be used to support people convicted of political violence. Canberra will halt the $10 million (Australian dollars) ($7.5 million USD) per year it gave to the World Bank's trust fund for Palestinian Authority recovery and development, Foreign Minister Julie Bishop said.